My last blog entry was in March. How lazy am I? But summer is almost here. My rowdy teenagers have two more weeks of school, then the school break is here. I'm telling you, I'm psyched about it. Finally I would have time to sit down and relax a little bit, get inspired to try some new recipes I've been meaning to do in the past few months, read books, and maybe some beach time here and there. Doesn't that sound wonderful? The first half of 2015 passed by so quickly. Everybody has been busy doing something (except Stuey the crazy Dale, he spends half of his day napping and the other half begging for food), dinnertime is the only time our family can sit down and be together, then they're off to do homework or whatever else. Most days, I have one hour to cook dinner, if I'm lucky. So needless to say, dish like this roasted chicken thighs is a lifesaver. It's quick, it's super easy, and it's definitely tasty. In a bowl whisk together olive oil, mustard, garlic, lime juice, rosemary, salt and pepper until well combined. Transfer marinade to a large sealable freezer bag. Add chicken thighs to the bag, seal and shake to coat. Place freezer bag in the refrigerator for 30 minutes to 2 hours. Preheat the broiler. 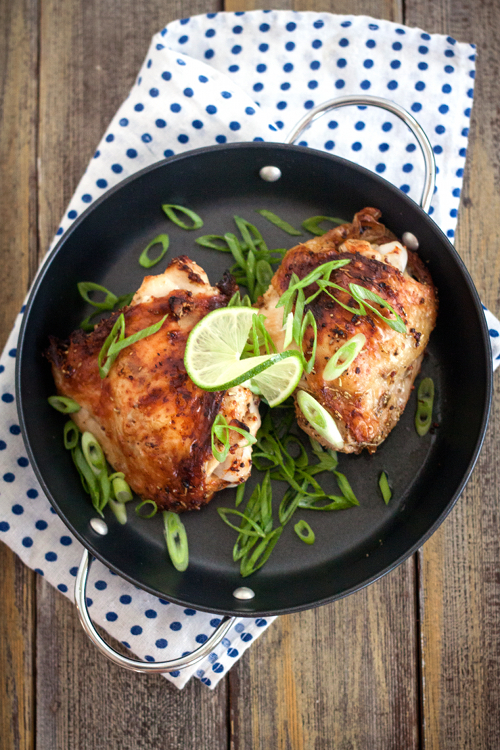 Take out the chicken and lay them on broiler pan, skin side up. Insert a thermometer into the thickest part of the chicken, then broil the chicken until the skin turns golden brown, about 5-10 minutes. 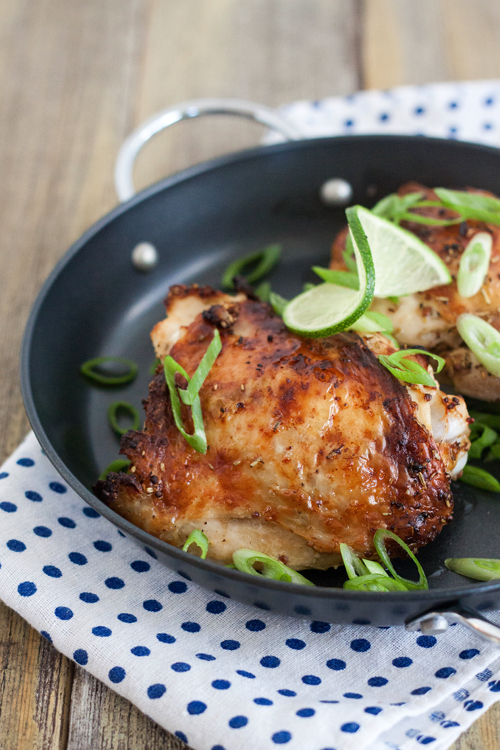 Reduce the oven temperature to 375 F. Continue roasting until the thermometer temperature reaches 165 F. Transfer chicken to a serving platter, garnish with sliced green onion. Your blog was too good. i really appreciate with your blog.Thanks for sharing. Hello dear .You put really very helpful information. It’s pretty worth enough for me. In my opinion, if all webmasters and bloggers made good content as you did, the web will be a lot more useful than ever before. Check out my site best mothers day messages 2016 and surprise your mother on Mothers day. Have a look at Happy Veterans Day if you want to know about veterans day, which is one of the most important holidays in the U.S and why is it celebrated. Stay updated with all the latest information. I loved this, this could be made on festivals. This is a great article. It gave me a lot of useful information. thank you very much. Want to know about Veterans Day,which is a day to celebrate the great officers of the US army,just checkout my blog Veterans Day Poems and stay updated. At last, it's here. I will be telling you the ways you can use to find food near you in a matter of seconds, Just blink the eye and the restaurants near me are here on the mobile screen. Thank you for sharing this incredible post with us. nice blog thanks for sharing with us. Swastik Financial Services provides loan services in Hyderabad. Which player have a Orange Cap in IPL ??? Which player have a Purple Cap in IPL ??? Thank you for sharing this Helpful and knowledegeble post with us. red_shallot_kitchen 2011-2013. Powered by Blogger.